Ghost Vodka Silver is a popular Vodka available from 31dover.com in 70cl to buy online. Visit 31dover.com for the best price for 70cl of Ghost Vodka Silver or compare prices on our other Vodka products. Ghost Vodka is an ultra premium British Vodka. It has really fruity aromas - it almost like a kirsch or other distilled fruit drink - maybe this is down the fact that it's made with British sugar beet instead of wheat or potatoes. It tastes bright, smooth and warm. There's a touch of spice and a long, smooth finish with unusual and very pleasant flavours of fennel, leather, caramel and vanilla. We also took in the taste of those caramel peanuts you get at fairgrounds. Packed with flavour, this outstanding Vodka is of course great for cocktails (keep them simple so the Vodka can shine), but is also enjoyable neat. 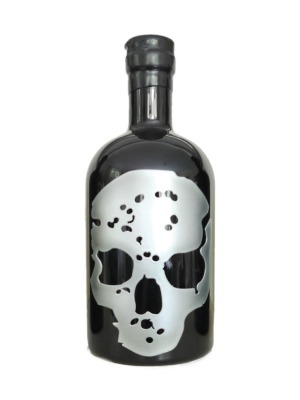 Ghost's minimalist bottle and aluminium skull label are striking - the skull acts as the logo, and no name is displayed. This one's skull is a sleek silver. Distilled in a haunted salt depot in Cambridge, the Ghost Vodka crew like to think that the ghosts lend a hand with production. Well it is hauntingly good! Sorry. Where to buy Ghost Vodka Silver ? Ghost Vodka Silver Supermarkets & Stockists. You can buy Ghost Vodka Silver online in most retailers and find it in the Vodka aisle in supermarkets but we found the best deals online for Ghost Vodka Silver in 31dover.com, DrinkSupermarket.com, and others. Compare the current price of Ghost Vodka Silver in 70cl size in the table of offers below. Simply click on the button to order Ghost Vodka Silver online now.